Magnificently reported and soulfully crafted, An Elegant Defense is an epic, first-of-its-kind exploration of the human immune system and the secrets of health, by the Pulitzer Prize-winning New York Times journalist Vividly told. ... Explicates for the lay reader the intricate biology of our immune system. -JEROME GROOPMAN, New York Review of Books One of those rare nonfiction books that transcends the genre. ... Extraordinary. -DOUGLAS PRESTON A National Indie Bestseller A terminal cancer patient rises from the grave. A medical marvel defies HIV. Two women with autoimmunity discover their own bodies have turned against them. 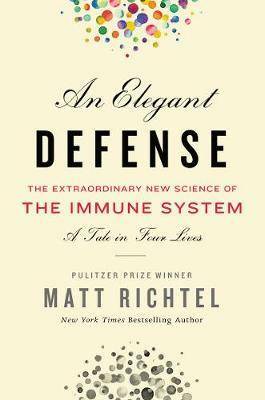 Matt Richtel's An Elegant Defense uniquely entwines these intimate stories with science's centuries-long quest to unlock the mysteries of sickness and health, and illuminates the immune system as never before. The immune system is our body's essential defense network, a guardian vigilantly fighting illness, healing wounds, maintaining order and balance, and keeping us alive. Its legion of microscopic foot soldiers-from T cells to natural killers -patrols our body, linked by a nearly instantaneous communications grid. It has been honed by evolution over millennia to face an almost infinite array of threats. For all its astonishing complexity, however, the immune system can be easily compromised by fatigue, stress, toxins, advanced age, and poor nutrition-hallmarks of modern life-and even by excessive hygiene. Paradoxically, it is a fragile wonder weapon that can turn on our own bodies with startling results, leading today to epidemic levels of autoimmune disorders. Richtel effortlessly guides readers on a scientific detective tale winding from the Black Plague to twentieth-century breakthroughs in vaccination and antibiotics, to the cutting-edge laboratories that are revolutionizing immunology-perhaps the most extraordinary and consequential medical story of our time. The foundation that Richtel builds makes accessible revelations about cancer immunotherapy, the microbiome, and autoimmune treatments that are changing millions of lives. An Elegant Defense also captures in vivid detail how these powerful therapies, along with our behavior and environment, interact with the immune system, often for the good but always on a razor's edge that can throw this remarkable system out of balance. Drawing on his groundbreaking reporting for the New York Times and based on extensive new interviews with dozens of world-renowned scientists, Matt Richtel has produced a landmark book, equally an investigation into the deepest riddles of survival and a profoundly human tale that is movingly brought to life through the eyes of his four main characters, each of whom illuminates an essential facet of our elegant defense.